Two resorts in the Philippines have made it to the list of U.S. travel magazine, Conde Nast Traveler's 30 Best Resorts in Asia, the Department of Tourism (DOT) said on Thursday. According to the Conde Nast website, Shangri-La's Boracay Resort and Spa in Boracay and El Nido Pangulasian, in Palawan ranked 30th and 12th on the magazine’s Reader’s Choice Awards 2014, respectively. The DOT confirmed the news on its official Twitter and Instagram account. "Raise your glasses once again because two resorts in the Philippines made it to the list of Conde Nast Traveler's Best Resorts in Asia -- Boracay Shangri-la and El Nido Resorts in Palawan!” the department said. El Nido, which finished last on the list, received a ranking of 83.214. The magazine described the resort as a "luxurious hideaway (a quick boat trip from the airport)" to the island biosphere featured in The Bourne Legacy. "A one-hour charter flight southwest from Manila brings you to a one-runway airport where you're welcomed by a group of singing ladies," the site noted. "With scuba courses and access to more than 20 dive sites, as well as boat tours of caves and secret lagoons, you could spend all your time exploring, but the resort makes it equally tempting to stay put," it added. It also mentioned some of the resort’s featured activities including snorkeling, kayaks for guests' use, and a seemingly endless choice of lounging options. 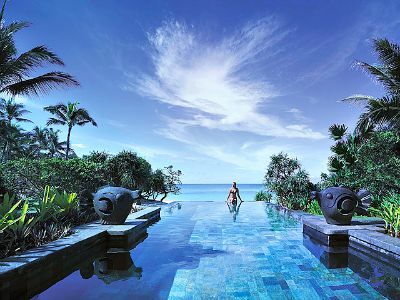 Shangri-La meanwhile received a ranking of 90.584 and was cited for being located on 30 beautiful acres in the country. It also praised the resort’s room interiors which showcase handwoven textiles and sconces made of local capiz shells and the beautiful sunsets eclipsed only by the great personal service. The Condé Nast Traveler magazine began traveling the globe tracking down journeys since 1987.